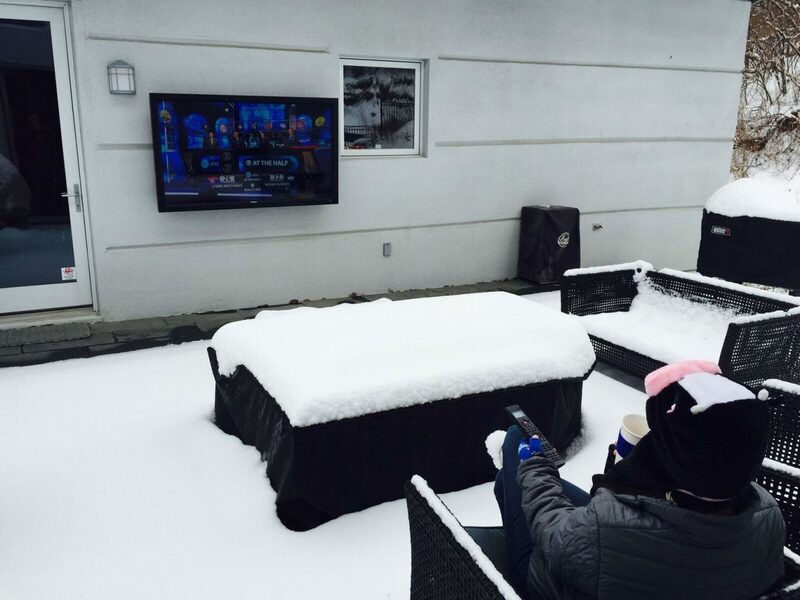 Rain or snow, all-weather televisions invite homeowners back to their outdoor spaces to enjoy all that winter has to offer! For those who find the cold invigorating and who can’t wait to put on their winter wardrobe, outdoor TV entertainment is the hot new thing. All-weather televisions from SunBriteTV are transforming open-air kitchens, outdoor fireplaces and decks into year-round hang out spaces, allowing winter people to enjoy their backyard spaces all year long. SunBriteTV televisions are engineered for permanent outdoor installation, so when the weather gets fierce, there’s no need to drag the display indoors. Equipped with internal heaters and powder-coated aluminum exteriors, both the SunBriteTV Veranda and Signature Series televisions shrug off the precipitation in temperatures as low as -24° F, while the SunBriteTV Pro Series comfortably operates in temperatures as low as -40°F. The company’s recently upgraded Veranda Series televisions feature enhancements that offer crystal-clear image quality, expanded control and audio options, and a new sleek design. The upgrades include full HDR support, a significantly brighter screen, IP-control, and plug-and-play compatibility for SunBriteTV outdoor soundbars — delivering a new level of performance at an affordable price. Like the original Veranda Series, the new line is weatherproof, comes with a premium direct-lit 4K UHD screen and is designed for permanent outdoor installation in full-shade areas. Perhaps the most significant enhancement is the addition of HDR, which provides a striking improvement in contrast and color accuracy. With a brighter 400-nit screen, the Veranda Series is now up to 50-percent brighter than most indoor televisions, and 30-percent brighter than its predecessor. Learn more about all SunBriteTV televisions for residential and commercial applications here.